Inspired by Serial Experiments Lain, this game takes you on a surreal trip through a twisted virtual network. 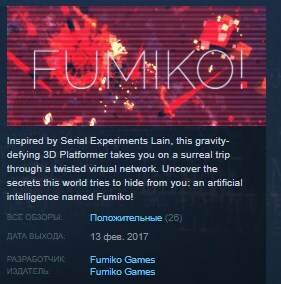 Uncover the secrets this world tries to hide from you: an artificial intelligence named "Fumiko"! Fumiko! combines rewarding exploration with a new approach to 3D platforming. You'll quickly be unbound from gravity. No jump will be too short. This game is a dystopian sci-fi thriller that wants to be explored thoroughly.